I eat out all the time, and I'm always searching for something new and different. The list of places that I return to after more than a couple of visits is rather short. 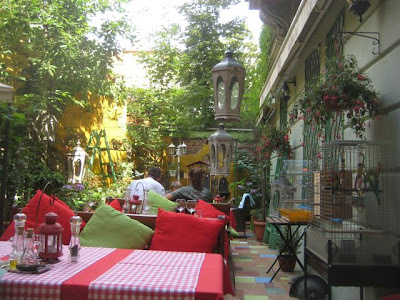 When we're floating around Malá Strana and hunger strikes, we'll usually end up at one of three places: Little Whale for moderately priced international cuisine, Noi for some of the better Thai food in the city, or Luka Lu for Croatian comfort food. We were at Luka Lu, which means "Harbor Lu," twice in the last few months. The first time, it was still warm, so we sat in their green, leafy garden in the back. 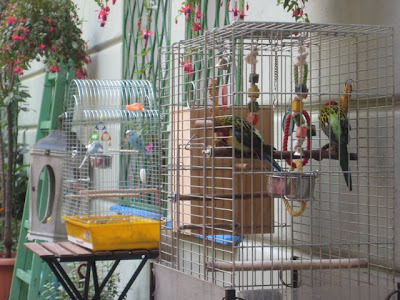 It's rather unique in that they keep a variety of colorful birds there. They provide entertainment by jumping, flying, and squawking around. I suppose someone might find them annoying or distracting. But most kids, like me, love 'em. 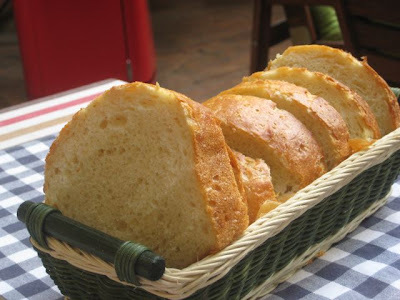 The waiter started us out with good, chewy, crusty bread. 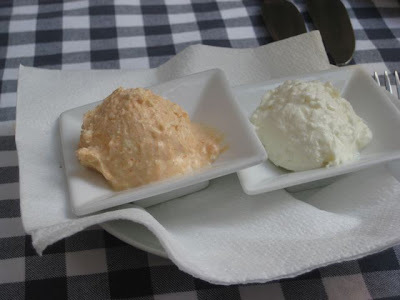 With it came two types of cottage cheese-like spread. One was plain, the other was mixed with garlic and paprika. The cheeses had a smooth, clean flavor. It was a much nicer alternative to butter. Just be aware, this nice start had a price. There was a 35 CZK per head cover. 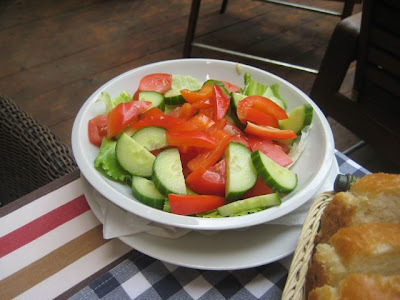 V got a mixed salad, which was mostly tomatoes and cucumbers (65 CZK). It needed dressing. I had to hunt down some oil and vinegar. It was very simple, and V thought it was a little too expensive for what it was. I've had a number of great starters here in the past, including the prosciutto and melon (175 CZK) and the roasted pepper stuffed with cheese (145 CZK). I first posted about this restaurant more than two years ago and wrote about some of these dishes. For a main course during our garden visit, I had calamari cooked on a lava grill (245 CZK). This is one of my favorites. The little squid were tender and smoky, not overcooked. There was a generous portion. And on the side was a lovely olive oil mixed with chopped fresh basil. A simpler but enjoyable version of pesto. 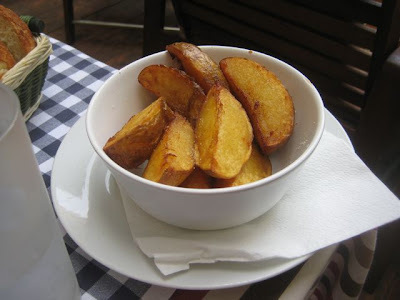 On the side, I had the American-style potatoes (55 CZK). This is a common feature on Czech menus, but the uninitiated should know that they are American only in the sense that French fries are French. They were a bit greasy, and a little bland. They're not the kind of potatoes you'd eat with ketchup. But I often order the condiment, ajvar, with them. 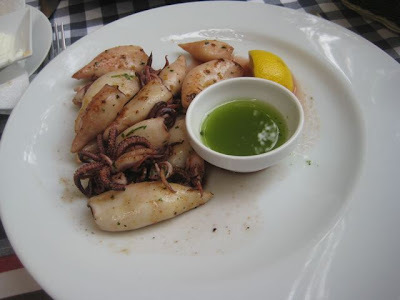 V loves a lot of the seafood dishes at Luka Lu, especially the octopus (385 CZK). It is baked and comes with what V describes as a "Balkan ratatouille." She also loves the "Spaghetti al'Gambari" (215 CZK). That's made with shrimp, basil, Parmesan, and cherry tomatoes. 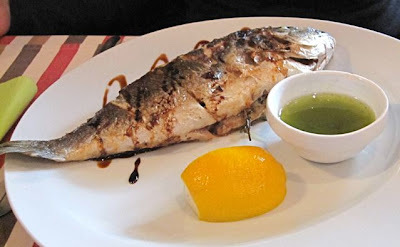 But at this meal, she ordered the grilled dorade (355 CZK). The fresh, sweet meat was grilled to perfection. It was not fishy at all. There was some lemon and the olive oil with basil on the side. Again, simple but right. On our second, more recent visit, we sat inside. 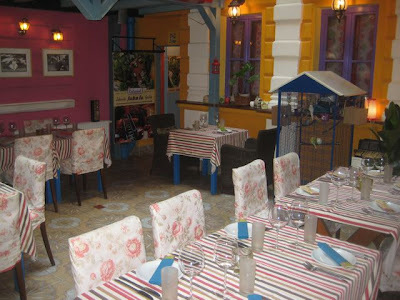 The restaurant is full of brightly colored kitsch. 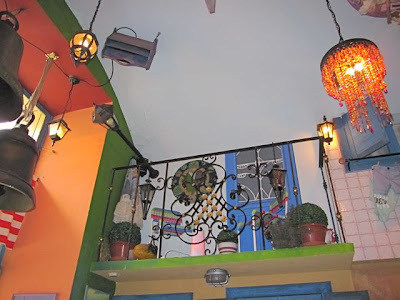 The doll house decor is not my favorite, but some people love it. It does have its cheerful aspects. 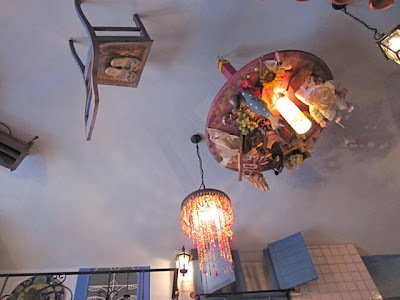 Even on the ceiling. 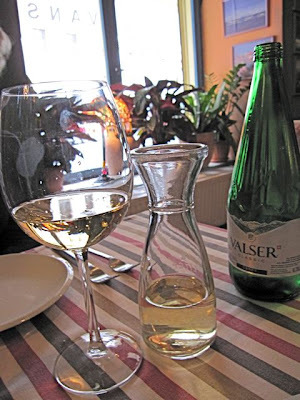 V had a couple of glasses of white wine (85 CZK each). I was annoyed they don't serve Mattoni in .33 liter bottles. Instead, they have those tiny .2 liter bottles of Bonaqua that do not quench my thirst, but parch my wallet. I boycott Bonaqua. So we ordered a .75 liter bottle of Valser sparkling mineral water (115 CZK). V ordered the dorade again. I chastised her for not ordering something different so as to offer a greater variety of information for you, the reader. However, the fish itself was as good as ever. She was not happy that the balsamic syrup that was under the fish on the first visit was now on top of it. She's a purist and didn't want uninvited flavors interfering with her fish. I decided I wanted pljeskavice -- Balkan ground and grilled meat. But there was mix up. They have two kinds. 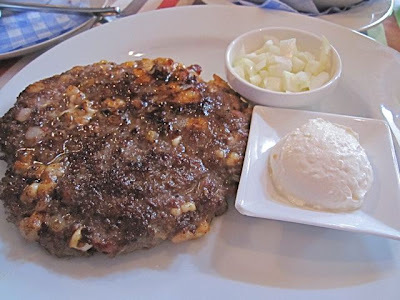 There was the "Gourmet Pljeskavice" made with Eidam cheese and bacon (225 CZK). 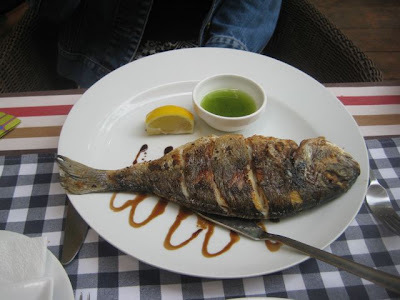 And there was just "Pljeskavice" stuffed with cream cheese (235 CZK). When the waiter took my order, I had already closed my menu, so I said I wanted the "normal" one, meaning I didn't want "Gourmet." I should have been clearer, but "Gourmet" was what he brought me. A debate then ensued between V and the waiter about whether "Gourmet" meant "normal" and whether the waiter should have asked if he wasn't sure what I wanted. The discussion was rather odd and somewhat unpleasant as the waiter was defensive. I said I'd eat the one that was served. In all honesty, I didn't like it so much. It had a pronounced bacon flavor, which I liked, but the meat patty was thick, tough, and chewy, and the cheese was on the rubbery side. 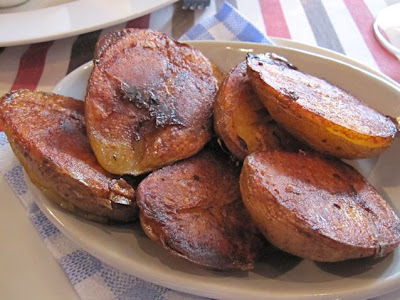 I had grilled potatoes (45 CZK) on the side, which were a bit overcooked. Knowing Luka Lu as we do, we wouldn't let a few problems stand in the way of a return visit. We've had plenty more positive ones over the years. I will say V likes the restaurant more than I do. She has had many meals there without me. As I said, she's a big fan of some of their seafood dishes. It's not a cheap place -- our bills there average 1000 CZK for two. But we almost always feel we are getting value for money. 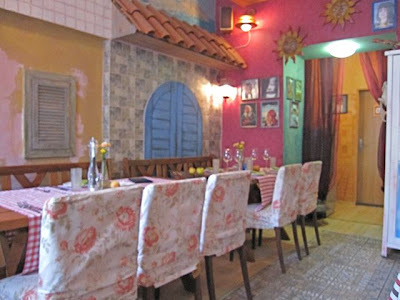 When navigating the treacherous, touristy restaurant scene of Prague, most people find a safe harbor at Luka Lu. I love the mark twain quote! The food looks incredible too! 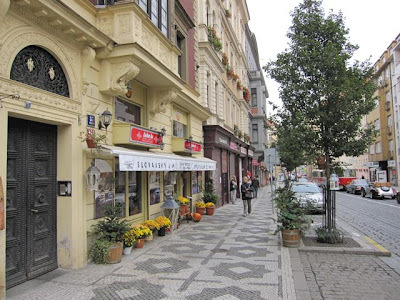 I'll be traveling to Prague in about a month to study abroad; do you have any recommendations for cheap student eats around Charles University? Thanks!